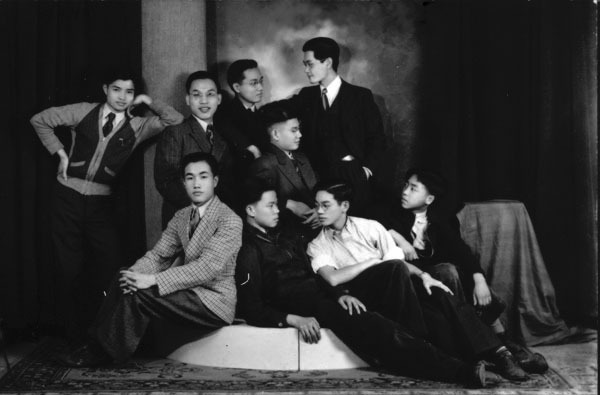 Description: Nine young Chinese men recently immigrated to the United States, sitting for a dramatic group photograph. All, including photographer Fong, were employees of the Chinese restaurants, Holly Café and Pan-American Café. Keywords: Business and industry, photography, people, Chinese Americans, Asian Americans. Description: Mar Suey Fong setting up a photo shoot of friend Wayne Wong in Sim Park. 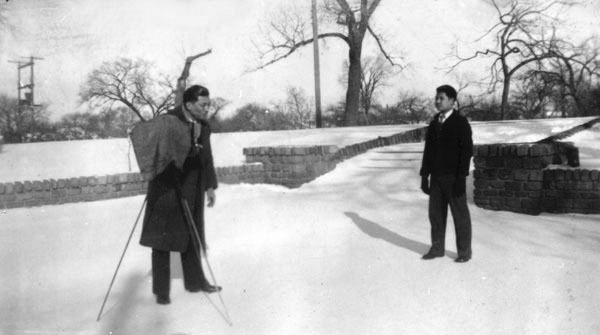 Both young men were employees at the Chinese American restaurant, the Pan-American Café. They immigrated to the U.S. in the mid-1930s. Keywords: Business and industry, photography, camera, people, parks, Chinese Americans, Asian Americans, Wichita. 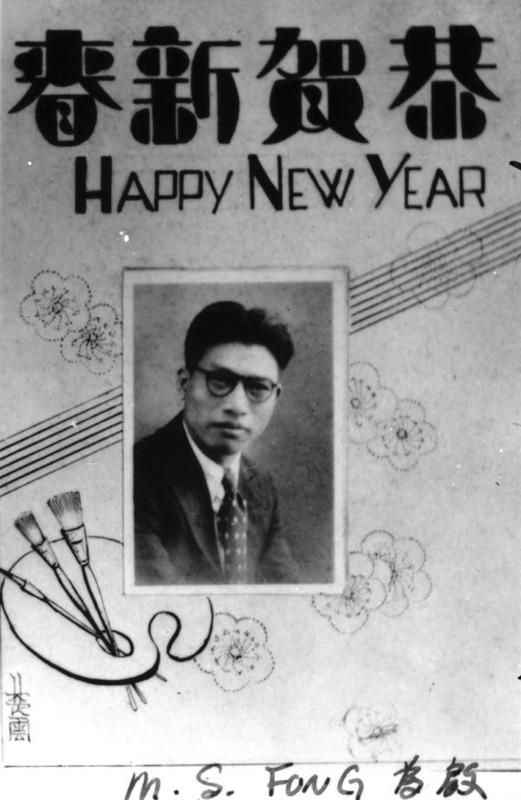 Description: Photograph of M. S. Fong printed on a greeting card. The message “Happy New Year” appears in Chinese and in English. Chinese characters also represent his name in the handwritten note at bottom. Keywords: Business and industry, photography, people, Wichita. 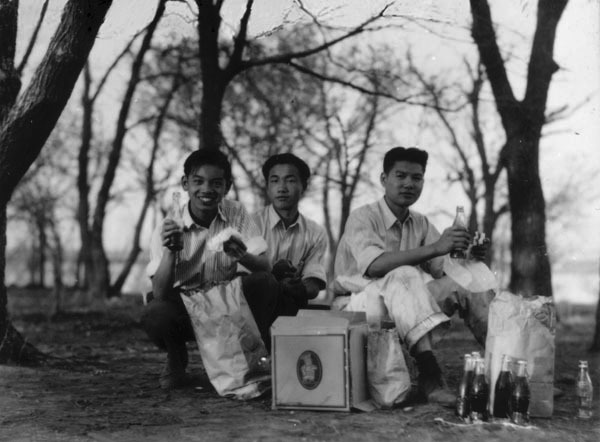 Description: Three young Chinese men eating a picnic lunch at Santa Fe Lake. All are identified (on file). They immigrated to Wichita in the 1930s and were employed at the Pan American Café. A local man who befriended them occasionally gave them rides in his car and took them on outings on their days off from work. Keywords: Business and industry, parks, people, employment, occupations, immigrants, sports and recreation, Coca-Cola. 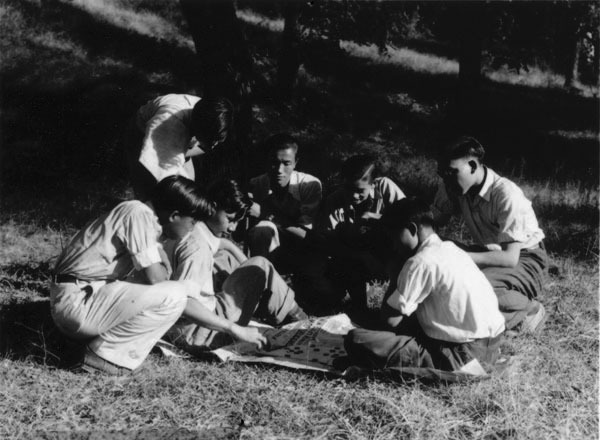 Description: Seven young Chinese men (all identified, on file) on an outing at Santa Fe Lake. All were Chinese immigrants who came to Wichita in the 1930s and were employed at the Pan American Café. Keywords: Business and industry, parks, people, employment, occupations, immigrants, sports and recreation, games.